*This is a sponsored post by the maker of ARM & HAMMER™ Super Washing Soda. I received compensation for this review but the opinions are 100% my own. 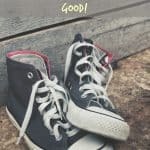 I’ve been making my own homemade laundry detergent recipe for years now and I love how much money it saves me, while still cleaning my family’s clothes so well! I’ll show you how you can make a batch for under $25 that will last you a year (depending on the size of your family)! 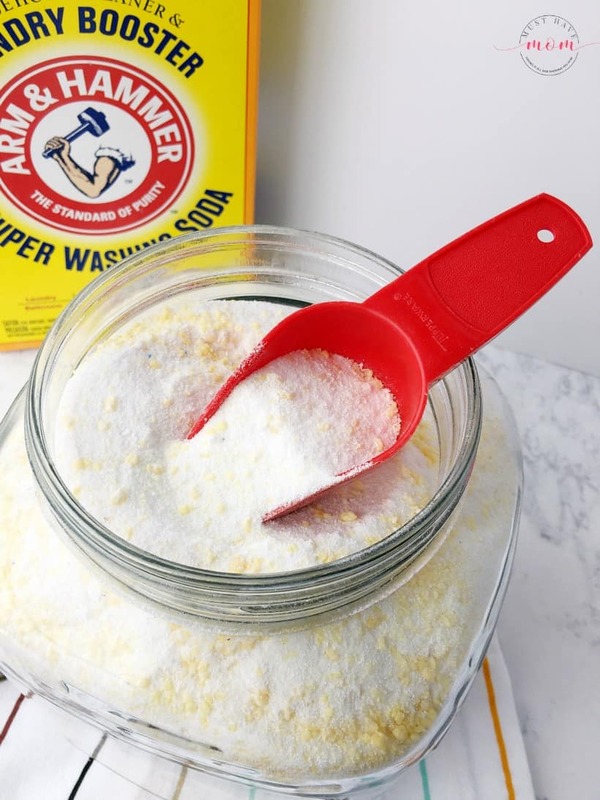 I love that making this laundry detergent only takes about 15 minutes to create a big batch that lasts our family of 6 about 6 months (doing daily laundry!). 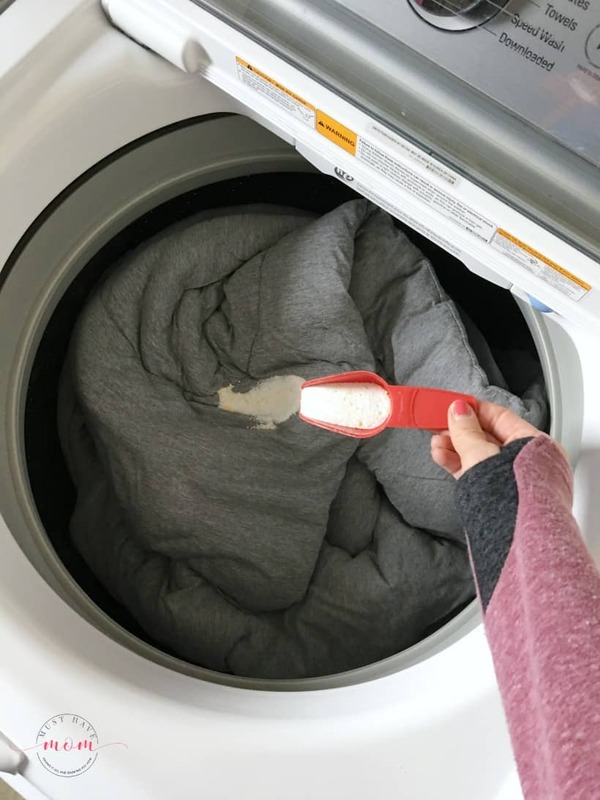 It’s quick and easy to make and it gets your clothes clean! Want to learn how to make it? I’ll show you! The ingredients you need to make your own homemade laundry detergent are basic and inexpensive. You will need ARM & HAMMER™ Super Washing Soda, laundry bar and stain remover (looks like a bar of soap), borax, ARM & HAMMER™ baking soda, and OxiClean™ (38 load size container). You can also get powdered fabric softener to add to it if you prefer a scent in your laundry soap. 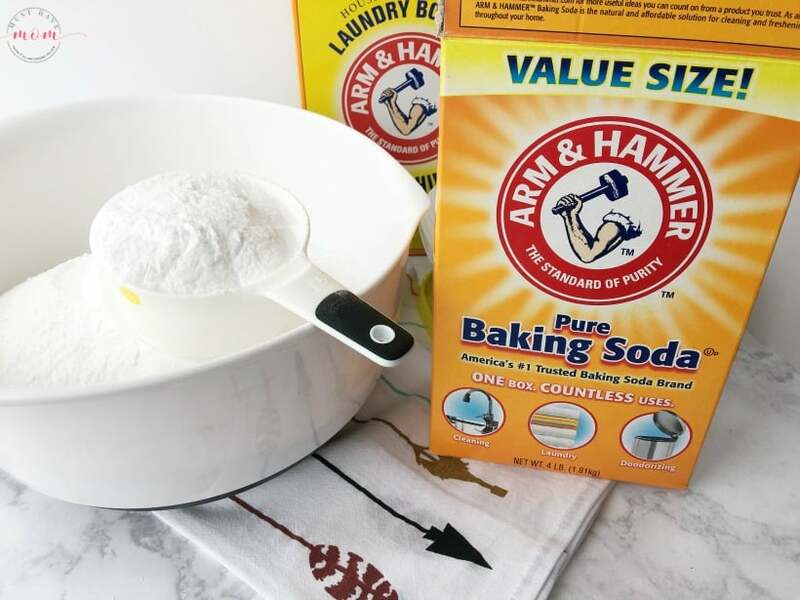 Before I started making my own laundry detergent I had never heard of ARM & HAMMER™ Super Washing Soda. You can find it in the laundry aisle in a box. Now that I have discovered it I can’t stop using it! It has so many different uses and it is all natural. If you aren’t familiar with it, I’ll share a few of my favorite uses. instructions when adding laundry products, add clothes and let water fill completely. aluminum and follow manufacturer guidelines. 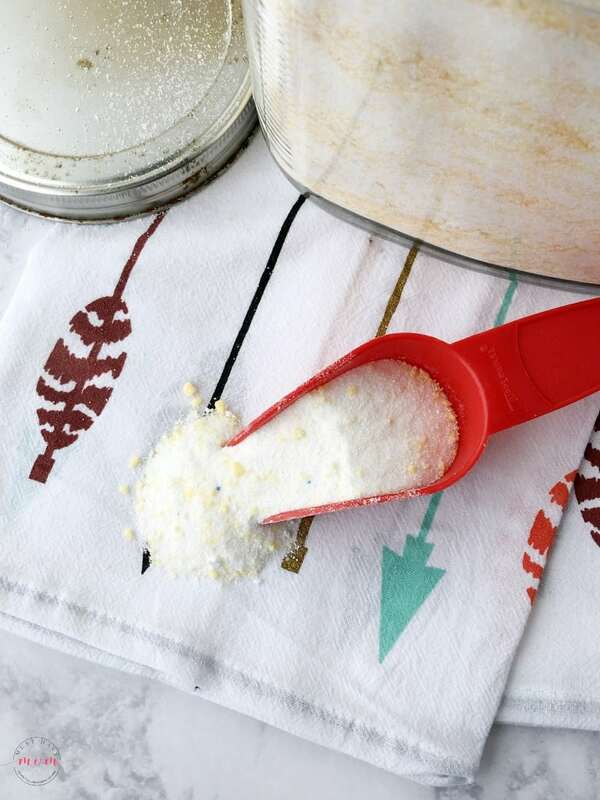 Let’s get started making the homemade laundry detergent recipe! Begin by grating the laundry bar in a food processor with the grating blade. If you don’t have a food processor you can use a cheese grater but a food processor makes this process much faster and gets it grated more finely. 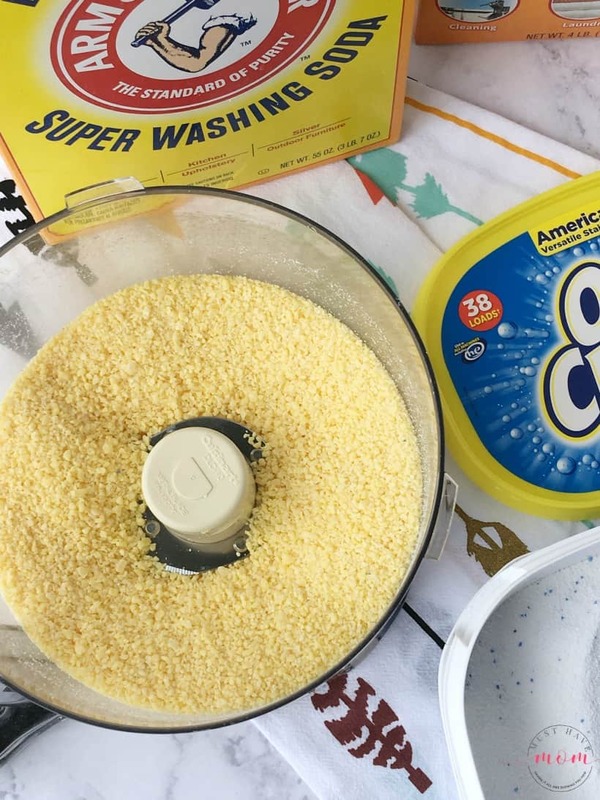 After you have grated all three laundry bars, add a scoop of OxiClean™ Versatile Stain Remover to the mix and return it to the food processor to grate it into a powder. 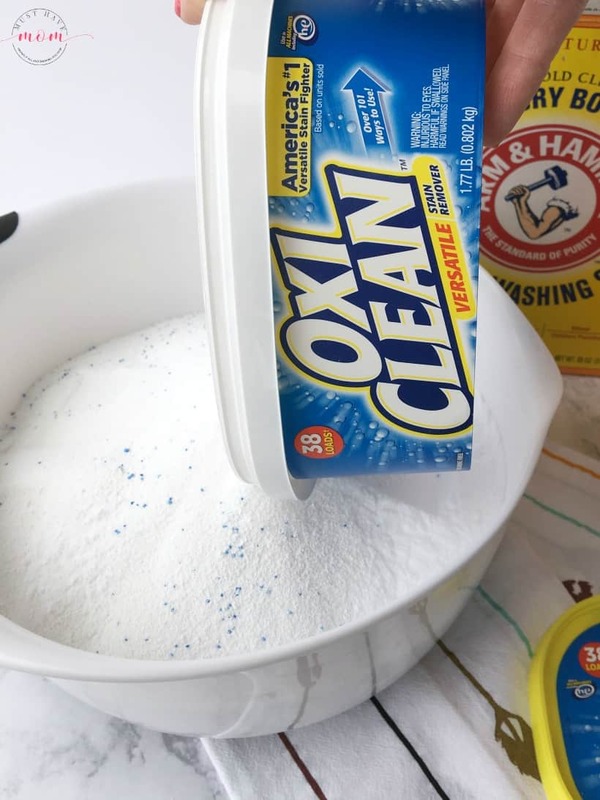 The OxiClean™ will help it achieve a more fine powder as it adds a little grit to the mixture. Pulse it until it reaches a fine consistency like the photo above. Then dump all of it into a very large bowl. Now it’s just a matter of mixing in the remaining ingredients! Add your entire box of ARM & HAMMER™ Super Washing Soda. Super Washing Soda adds extra cleaning and freshening power as a laundry detergent booster and will help get your clothes extra clean! Then mix in the 38 load size container of OxiClean™ Versatile Stain Remover. This will add a stain removing element to your homemade laundry detergent. Then add 2 cups of ARM & HAMMER™ Baking Soda to the bowl. Baking soda will give you whiter whites, help deorderize and brighter colors. The baking soda also softens the water, so you can actually use less detergent and it also helps deodorize your clothes. Finally, add the entire box of borax. Borax will improve the cleaning power of the detergent mixture, help remove tough stains, and deodorize and freshen. Then, mix together all the ingredients in the bowl until they are thoroughly mixed. Store detergent in a glass jar with a scoop or measuring spoon to dispense it. 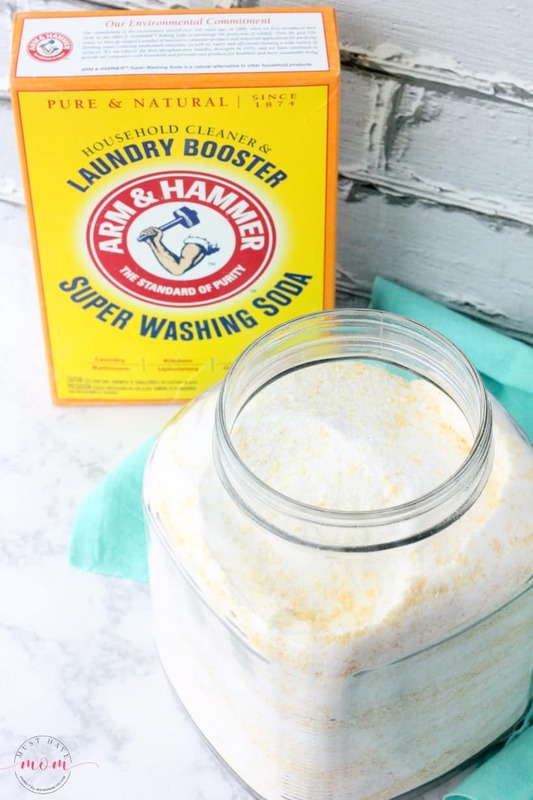 All the ingredients in this homemade laundry detergent recipe work together to deliver a powerful detergent that cleans clothes and leaves them smelling fresh and looking clean and bright! 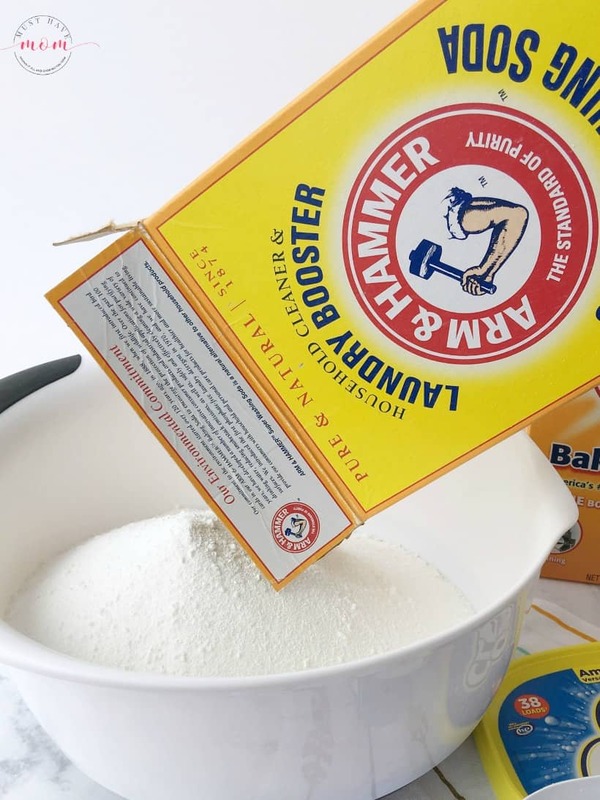 This homemade laundry detergent recipe works great for HE laundry machines as well as traditional machines. I have used it in both types of washing machines and it works equally well in both. Just add the powder to the drum of your washing machine. You’ll need 2 tablespoons per load. This recipe lasts a long time and for a small family or couple will likely last you a year. For larger families, you should get 6 months out of it! 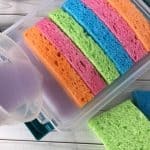 Take 15 minutes and make your own laundry detergent and take the money you save and spend it on something more fun than laundry detergent! 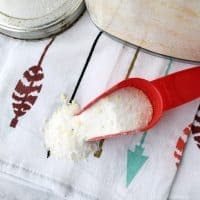 With the average family spending $150-$600 a year on laundry soap, think of the money you’ll be saving with this $25 a year detergent recipe! 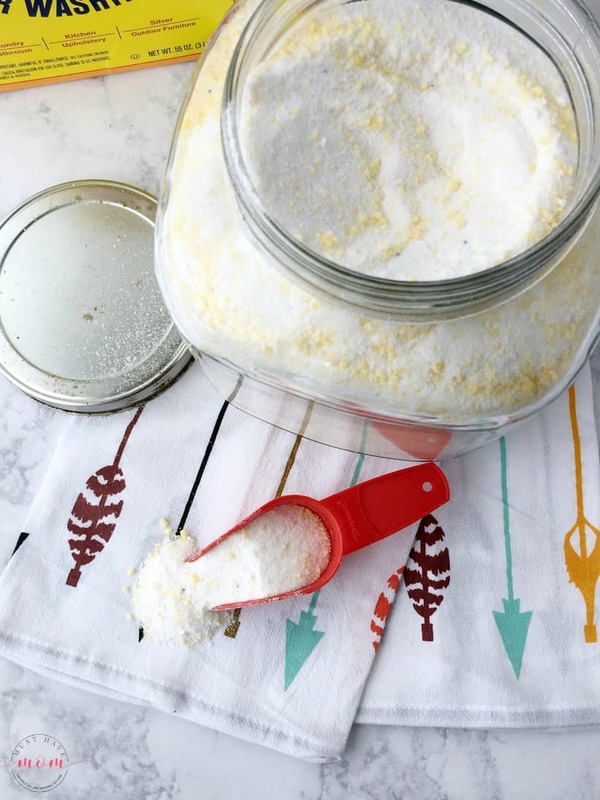 Quick and easy homemade laundry detergent recipe! Make a year supply for $25! Grate all three laundry bars in a food processor with the grating blade. Return to the food processor with the regular blade and a scoop of OxiClean™ Versatile Stain Remover to finely grate it. Pulse until mixture is a fine consistency. If you don't have a food processor then use a cheese grater. 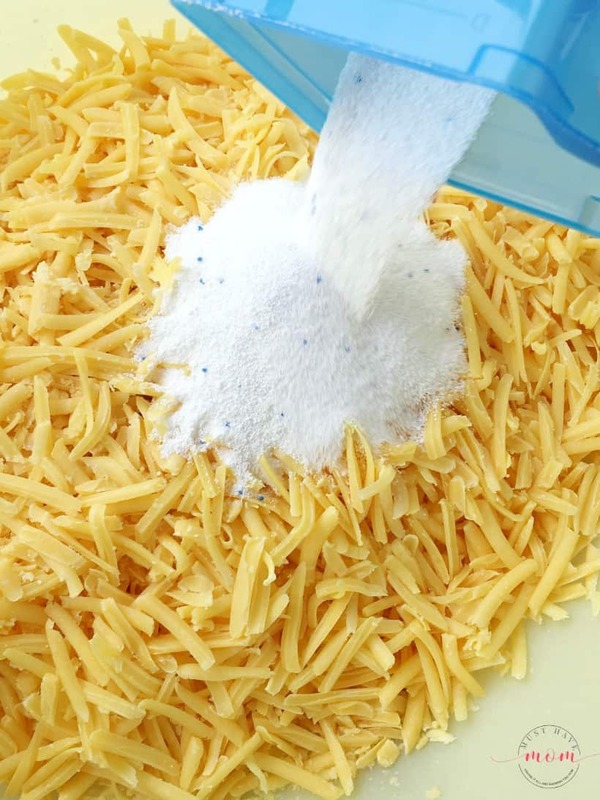 Dump grated soap into a very large bowl. 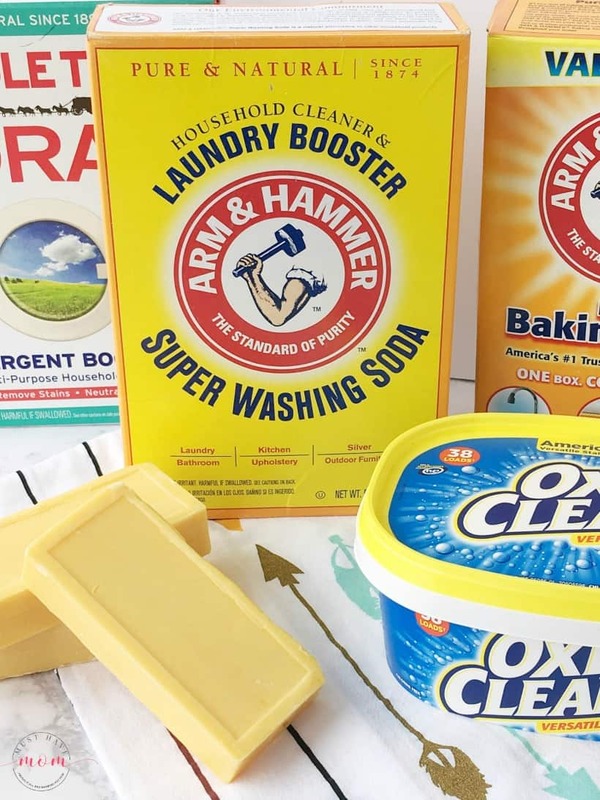 Add 1 box ARM & HAMMER™ Super Washing Soda, container of OxiClean™, 2 cups of ARM & HAMMER™ Baking Soda, 1 box of borax and optional fabric softener crystals. Use 2 Tbsp per load, put detergent directly in barrel. 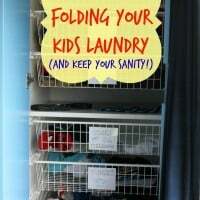 Laundry Hacks Every Mom MUST KNOW! $30 for a whole year, that’s awesome! I’ve been meaning to make up a batch of this, I pinned so I don’t lose this one. Thanks! How much does this recipe make? Or how many loads would you say it does? awesome! I think I am going to try this, do you think it will be ok on cloth diapers? any experience with this? wow I spend so much more on detergent currently! This would be an awesome way to save money! I am always interested in ways that I can save money. I can’t wait to make this, I have never made my own detergent. Thanks for sharing this with us. I love the fact that it could last my husband and myself a year! For $25 I can’t beat trying it right? lol. 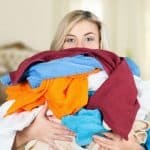 I will have to show my husband is he is the main laundry person in the house I bet he will love the idea. Thank you for sharing! 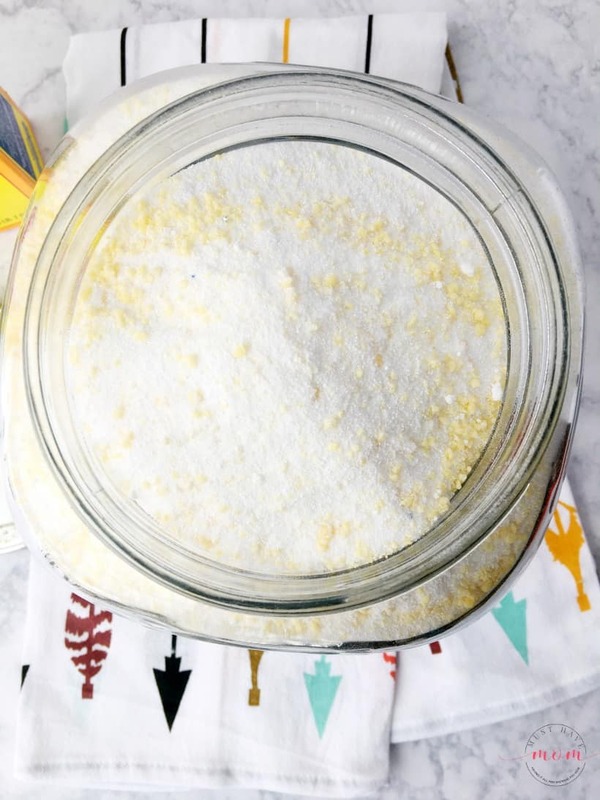 I am trying to be more DIY about the products that I use and this laundry detergent recipe is everything! This looks like a pretty great way to save money too- thanks for sharing! I’m going to pin this, we have stopped buying the smelly detergents with chemicals so this would be perfect and a great way to save money. This looks like an awesome laundry detergent recipe. What size boxes of the super washing soda and oxiclean do you use? Not sire if they sell them in different sizes but would like to make sure. how well does this work? I use tide and persil, but I too am looking for a diy laundry soap. Does this work in cold water? Yes, the only thing I wash in hot water are towels and sheets. I have been making my laundry soap for about 4 years. My first few loads, my clothes looked brighter and whiter, four years later my clothes still look new. Sure does make a lot!!! Hard to find a bowl big enough to mix it all together. Also hard to find suggested size of oxyclean as the only size available was 3 lbs. Can’t wait to use it tomorrow. I mix it in a 5 gallon bucket. I also save my Oxyclean containers to store my soap, I use the fabric softener with the dome lid in my soap. I use the lid as my scoop, you only need about 1/4 of a scoop per load. Thanks for the tips Lydia! There is only one size and you’ll find them near the laundry detergent. Just made it for the first time. Excited to see how well it washes. Super easy and fast to make, I used an empty detergent box to store it. All ingredients were purchased at WalMart. Only thing I didn’t find were the fabric softener crystals. Great to hear! I hope it’s working well for you. Leave your bar soap unwrapped for a couple of weeks to dry out this will make grading the soap so much easier. Find a salad shooter (I found mine at an estate sale for $1.50) this makes grading the soap so easy and fast. Your recipe says 2 TBsp/load. Do you use that same amount for HE and non HE machines? Hello! I use 1 tbsp for HE light loads and 2 tbsp for HE more soiled loads.